It’s more important than ever to improve the customer experience and build deeper customer relationships to build consumer trust and loyalty with your financial institution. 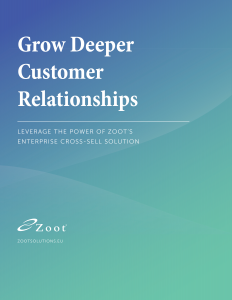 Zoot’s enterprise cross-sell solution enables financial institutions to enhance the customer experience — increasing retention of customers. Zoot’s solution is very attractive to financial services companies that want to extend real-time offers of credit across multiple channels. Take your customer relationships to the next level.